The 1875 Little Rock Accidentals. Standing left to right: Fred Syberg, Ormand Feild, Albert Wassell, and A. Jennings. Sitting: Chester Jennings, Horace Allis, Wood Tucker, Tolly Feild, Arthur Feild, and William Feild. Courtesy of the Old State House Museum. The Accidental Base Ball Club, commonly called the "Axes" for short, was an amateur baseball in Little Rock, AR from 1875-1876. The team participated in and won the 1875 Foul Flag Association championship. The Accidental Base Ball club was likely formed sometime in early 1875. The first mention of the club came on June 11th when the Arkansas Gazette reported the Accidentals had beaten the 'Hot Water' club in Hot Springs. 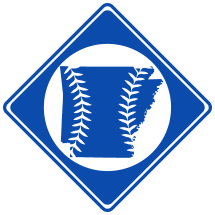 The game was billed as the "championship of the state", though that term was used rather loosely in the early years of Arkansas baseball. A crowd of 2000-5000 spectators showed up, which at the time was probably the largest ever attendance of a baseball game in Arkansas. The game was played "carelessly", but the Accidentals walked away with a 29-11 victory. A second game for the state championship was played on July 30th. This time, the game was played at the fair grounds in Little Rock, but the result was the same. The Accidentals took a 1st inning lead and never lost in, beating the Hot Waters by a score of 28-13. After losing twice to the Riversides of Memphis in August, the Accidentals joined the newly-formed Foul Flag Association in September. In 8 games, the Accidentals went 7-1, easily winning the championship. For winning, the club was awarded the championship flags. With the baseball season nearly over and the Accidentals the undisputed championship of the state, the team made arrangements for one more series. The St. Louis Red Stockings, a team that had competed in the major league National Association earlier that year, was invited to Little Rock to play two games at the fair grounds. On November 4th, the first game was played. The Accidentals played fair, but were defeated 19-7 nonetheless at the hands of the Red Stockings. The second game was played on the 6th, and St. Louis again gave the Accidentals defeat, winning 24-4. Next spring, the Accidentals reorganized, but the Foul Flag Association did not. On May 17th, the team traveled to Memphis, TN to play a professional team, but were given a disappointing blow, losing 30-0. After that, the team never quite achieved the same zeal as the year before. The Accidentals did fare well against the other Little Rock clubs, but not with the same dominance. In 1877, the Accidentals did not return. However, the legacy of the team's 1875 accomplishments remained untouched. In 1881, several of the former players attempted to again reorganize the club. But being out of practice, the team failed to again obtain its former glory. After a few disappointing games, the Accidentals were no more. However, throughout the 19th century, the Accidentals were remembered as Little Rock's champion team. The Accidentals had many players during its existence. Many of them were from upper-class families, becoming doctors, lawyer, and mayors. Occasionally, players from other Little Rock teams would fill in as subs, but the main team stayed fairly consistent.